Are you an aspirant looking for jobs in Government sector? Here is an excellent opportunity for you! The Unique Identification Authority of India has opened its recruitment for filling 01 posts in the Assistant Accounts Officer. The candidates below 56 years of age with certain eligibility criteria may apply for the post. The selection process for the UIDAI Recruitment 2019 will be based on the written test followed by the written test and the personal interview. The candidate may download the job application from the official site, fill them, attach the specified documents and send them to the mentioned address. The last date for your documents to be reached is on 30th April 2019. Make sure there is no delay in the process since if there are any there can be chances for your application to be invalid. Also, get updated with the official website to know further information about the recruitment process and also regarding the upcoming job vacancies to get into the government sector. 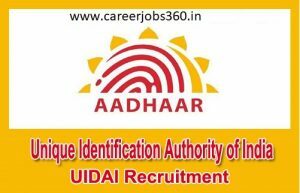 Step 1: The aspirants who are interested to apply for the UIDAI Guwahati Recruitment 2019 may visit the official website of Unique Identification Authority of India, www.uidai.gov.in. Step 3: Attach the required documents with an appropriately filled application and send them to the below-mentioned address. Make sure that the application reaches within 30th April 2019. In case of any issue in reaching or delay in reaching the application, it might not be considered valid. Selection for the post of Unique Identification Authority of India Recruitment 2019 will be based on the performance of the candidate in the written exam and the personal interview.